2017 update: Sigh. Well, the “good” news first. 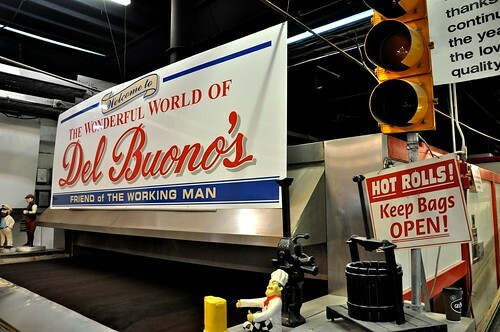 Del Buono’s is open. 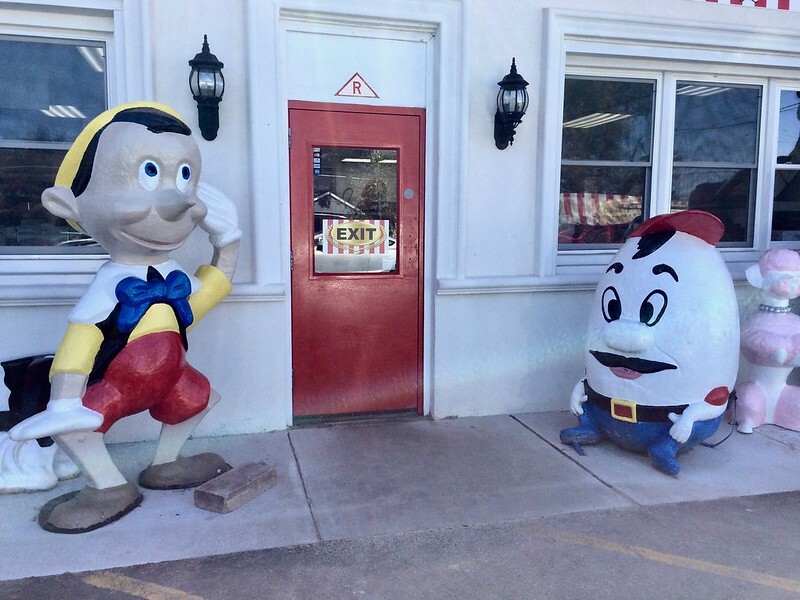 You can still pick rolls out of the giant oven, and some of the kitschy decor is still there. Now for the “bad” news – at least as far as Retro Roadmappers are concerned. The building has been completely done over, knocked down and expanded, “improved” and has very little Authentic Vintage Charm left – inside or out. Trust me – I know these thing happen because of Business Reasons, and they don’t have to be concerned with what Retro Roadmappers like. Oh, and I’m sure it’s much cleaner inside, and efficient and all that good stuff. But that doesn’t mean I have to be happy about it! So you’ve been warned! Here are a few snapshots of our fave pals. You can decide for yourself if you want to visit. I’m leaving this post up for posterity so people know what it used to look like. 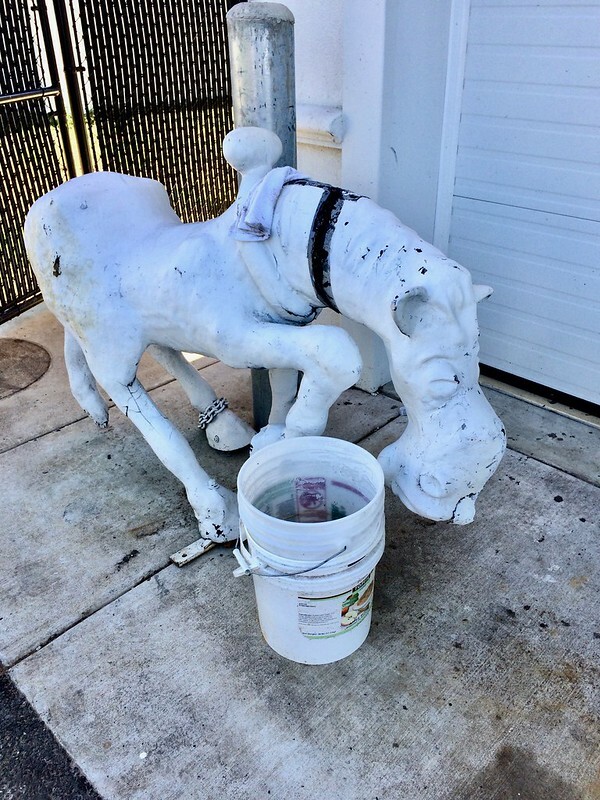 Poor horsie looks like he’s kicking the bucket – literally! Regular readers of Retro Roadmap know that there’s a certain type of vintage place that Mod B like so much. These are the places that you walk into and feel like you’ve stepped back in time. You can just feel it in your bones that “stuff has happened here” and you’re becoming part of the history of a place (unlike that disheartening “I could be anywhere in the USA having the same generic experience” feeling you get walking into a stucco box chain store. ) 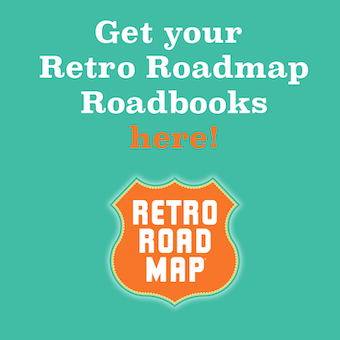 Many of these Retro Roadmap Worthy places are often run by the same family that started the business, and that is indeed a heartwarming thing.  But there are other classic old-school businesses that have new owners. While I’m often wary of this type of business, as new folks sometimes don’t get the charm that comes from a place that hasn’t been updated, there are a handful of new owners that I have met that I think are just fab. These are the folks that are attracted to vintage gems and want to honor the past and celebrate it. I call this type of owner, People Who “Get It”. 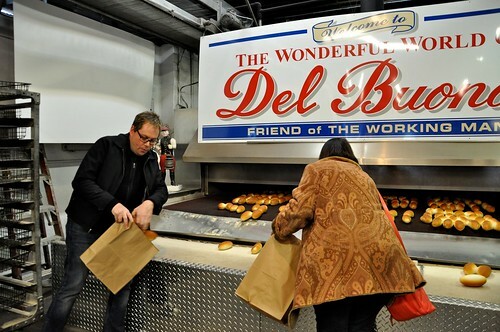 One of the first of these “Old Business / New Owner” folks that I have had the pleasure of meeting is Tom Whitman of Del Buono’s Bakery in Hadden Heights NJ. 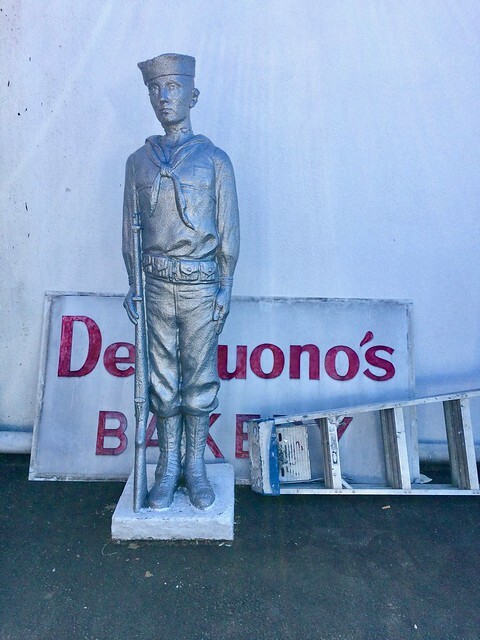 In August of 2013 Whitman (and his business partner/wife Larissa) purchased the bakery from original owner Nino Del Buono, whose family had started bakery business in Camden NJ more than 90 years ago. 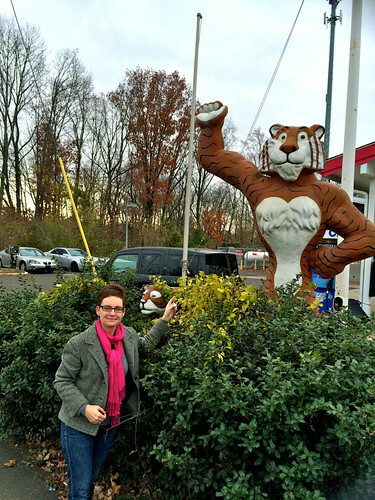 The Haddon Heights location just on the Black Horse Pike and conveniently accessible from Interstate 295 has been open since the mid 1960s. Well as some of us with the collector gene know, you buy one thing and enjoy it and then buy another. Get one more for 3 and you’ve hit the tipping point where you now officially have a collection, then they just kinda explode from there! 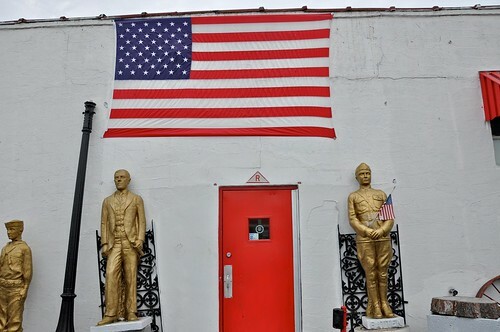 According to this story, original owner Nino Del Buono started his collection with one simple statue of a Life Size Statue Of Woodrow Wilson. Then he added a white Virgin Mary statue that he placed atop his business. Then somehow he acquired a horse and buggy, then a king sized rooster, and as they say, the rest is history. 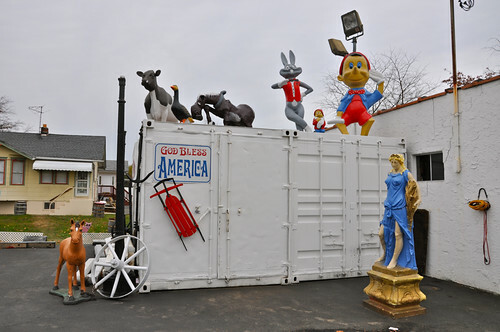 The horse and buggy are now perched on the roof of the business, as a nod to the Black Horse Pike location, and even the storage containers are festooned with characters obtained from closing miniature golf courses and the like. But let’s step inside, shall we? 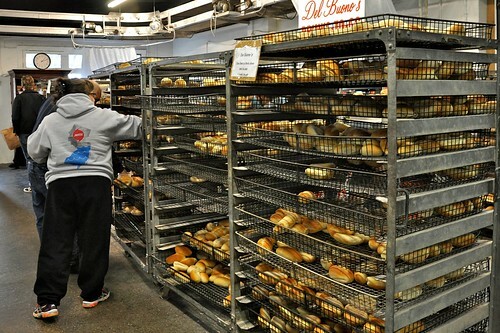 When you first enter the simple cinderblock building the first thing that hits you is the warm smell of fresh bread (I know technically a smell can’t have a temperature, but I bet you know what I mean.) 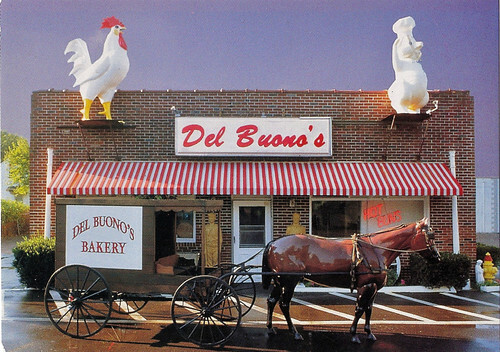 Del Buono’s isn’t a cake and cookie type bakery – thought they do have some sweets, and my fave Pepperoni Bread, but what they’ve been know for forever is their bread and rolls. But if you want to have a one-of-a-kind experience then head to the monsterous commercial oven just past the racks. If you’ve timed your visit right, you’ll soon be able to select your own hot fresh buns as they come directly out of the oven! Hot stuff, as Retro Roadhusband will attest, but you can’t get more fresh than that! AND this is the only place in the entire country where this practice has been grandfathered in. So live on the wild side, be nimble with your fingers so you don’t get burned and grab away! Just remember to leave your bag open so the steam can escape and you don’t get soggy rolls. 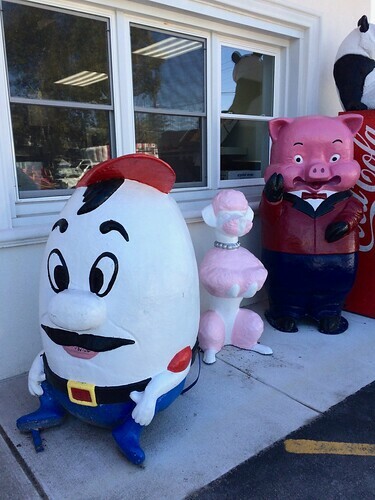 So not only do you have an awesomely fun kitschy exterior, but when you go in, you get a one-of-a-kind experience! 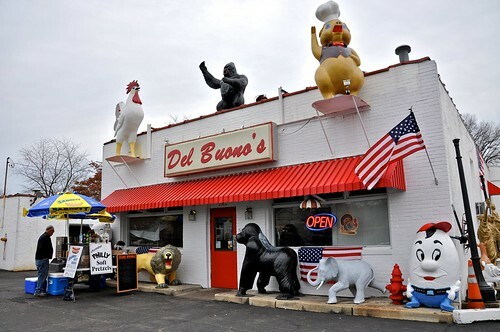 As a successful businessman he knew he needed to modify some things but knew he wouldn’t dare mess with the things that make Del Buono’s a fond family tradition for so many people. 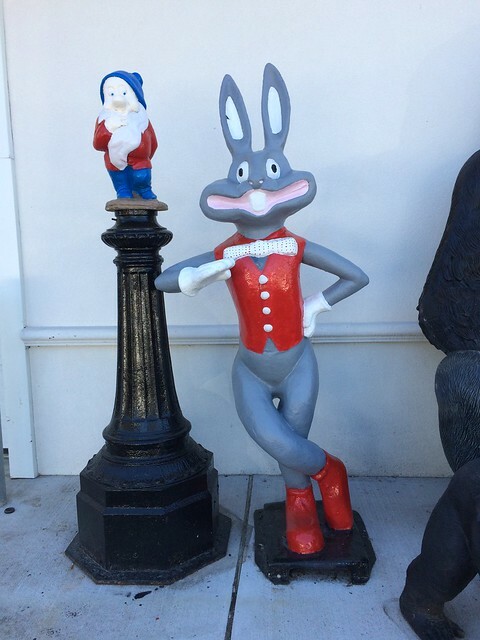 He’s painstakingly ensured that what he’s done is all towards improving the business and ensuring it’s legacy – from wanting to acquire additional statues, to giving the place a good scrub and updating things behind the scenes, he knows that he’s got a legacy to continue, and wants to honor that. And I think Woodrow Wilson would be proud. NextPacking the Tiki Togs, Prepping for a Mai Tai – We’re Hukilau-bound!